FAYETTEVILLE, Ark. – University of Arkansas junior Gabriela Lopez was named as a Honda Golf Award nominee by the CWSA and the Honda Awards committee the organizations announced today. Lopez, who played to an NCAA runner-up final at the national championship May 25 and qualified for the U.S. Women’s Open June 3, I three-time Women’s Golf Coaches Association All-American. She ranks third in the final Golfstat.com rankings after posting a bogey-free final round 66 at the NCAA Championship. Lopez is ranked No. 5 by Golfweek.com and No. 4 in the Southeastern Conference. The two-time All-SEC First-Team selection has 50 head-to-head wins against players in the top 25 this year and she led the team with a 71.75 stroke average. Lopez finished the season with four consecutive top-10 finishes. 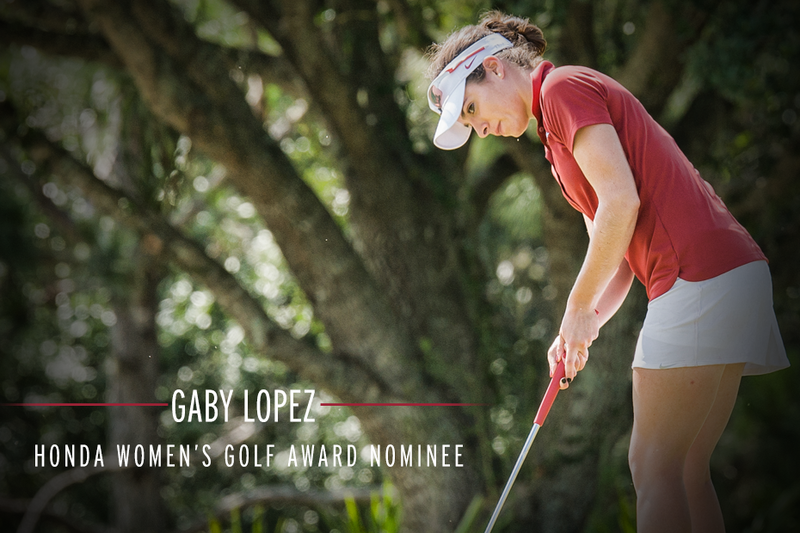 Lopez is one of three Razorback women’s golfers to be nominated. Former Razorback Stacy Lewis was a nominee in 2007, after winning the NCAA individual title, and 2008 and Kelli Shean, who also played to a runner-up finish, was a nominee in 2011. Lopez is on the ballet with Bronte Law of UCLA, Leona Maguire from Duke University and Emma Talley from the University of Alabama. The Honda Sports Award is presented annually by the CWSA to the top women athletes in 12 NCAA- sanctioned sports and signifies “the best of the best in collegiate athletics”. The winner of the sport award becomes a finalist for the Collegiate Woman Athlete of the Year and the prestigious 2015 Honda Cup. The nominees were chosen by a combination of NCAA Championship finish and national golf rankings. The Honda Sports award winner for golf will be announced next week after voting by administrators from over 1,000 NCAA member schools. Each NCAA member institution has a vote. Honda Sports award winners will be presented with the honor during on-campus presentations throughout the year and all Honda Sports award winners become a finalist for the prestigious 2015 Honda Cup award which will be presented on June 29, in a live televised broadcast on CBS Sports Network from L.A.
For more information on Arkansas women’s golf, follow @RazorbackWGolf on Twitter.